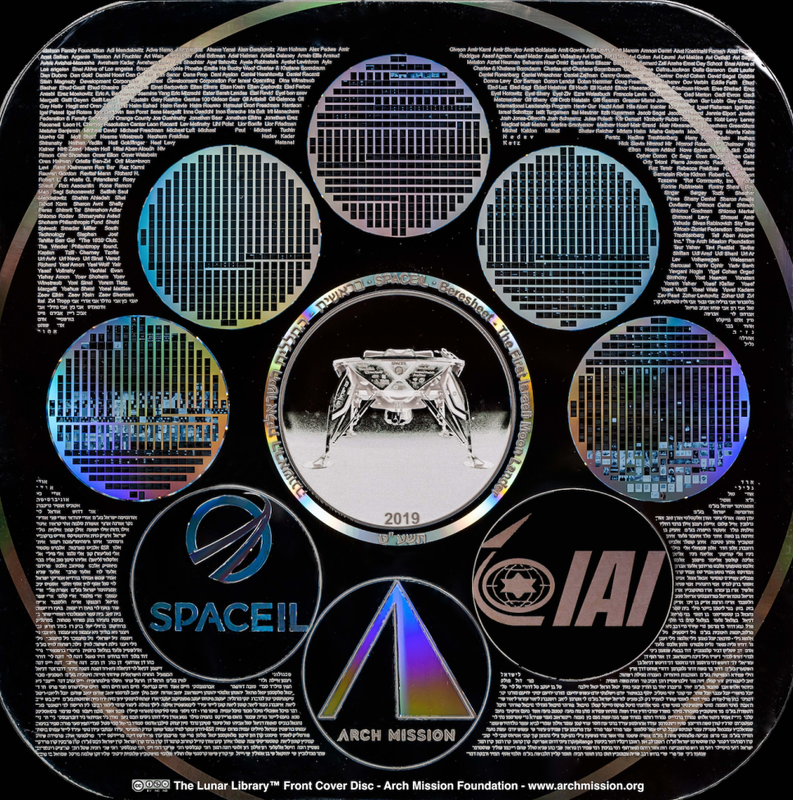 The Arch Mission Foundation is nano-etching 30,000,000 pages' worth of "archives of human history and civilization, covering all subjects, cultures, nations, languages, genres, and time periods" onto 25 DVD-sized, 40-micron-thick discs that will be deposited on the surface of the moon in 2019 by the Beresheet lander. Included in the archive are about 200GB worth of content, including the text and XML of English Wikipedia, and tens of thousands of books of all kinds. The Arch Mission Foundation is seeding copies of this archive around our planet and elsewhere in our solar system. An accompanying white-paper gets into more detail. The first four layers contain more than 60,000 analog images of pages of books, photographs, illustrations, and documents - etched as 150 to 200 dpi, at increasing levels of magnification, by optical nanolithography. The first analog layer is the Front Cover and is visible to the naked eye. It contains 1500 pages of text and images, as well as holographic diffractive logos and text, and can be easily read with a 100X magnification optical microscope, or even a lower power magnifying glass. The next three analog layers each contain 20,000 images of pages of text and photos at 1000X magnification, and require a slightly more powerful microscope to read. Each letter on these layers is the size of a bacillus bacterium. Also in the analog layers of the Library is a specially designed “Primer” that teaches over a million concepts in pictures and corresponding words across major languages, as well as the content of the Wearable Rosetta disc, from the Long Now Foundation, which teaches the linguistics of thousands of languages.